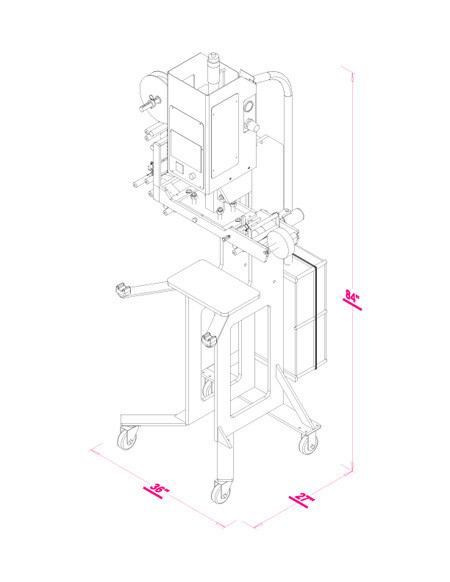 The A10K1 hot stamping machine features 5 tons of stamping power. PLC control system with color touch-screen operator interface. Dual speed heat transfer indexer including stepper motor, motor control, and speed adjustment dial. Photoelectric eye detection system with fine tune left-to-right and front-to-back image adjustment capability. 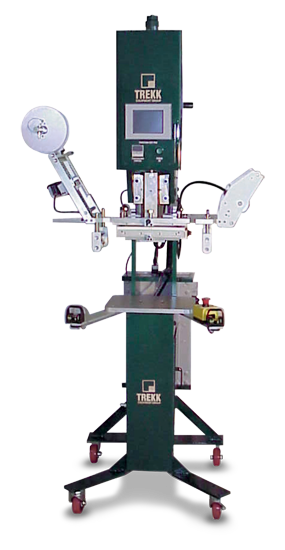 Dual opto-touch palm button press safety control with anti-tie down, anti-repeat, and pinch point interlocks. Digital display solid state proportioning temperature control. Pure dwell timing with proximity switch sensor. 120 VAC input power requirement. Pneumatic powered main press cylinder. Fine tune penetration control on stamping cylinder. Flow control to provide cylinder head speed adjustment capability. Pneumatic regulator and gauge to control output pressure. Pneumatic filter unit to purify incoming air. Modify force output capacity by changing pneumatics only (range1 to 5 tons). 5" x 12" heated head with 5" x 10-1/4" imprint area. Quick change dovetail plate to mount die/die block. Four corner fine tune head leveling adjustment. Head daylight adjustment of 0-16 inches with ram fully extended. Quick change web payout and take-up systems. 6-inch wide web feed capacity. Sturdy hot rolled solid steel support frame. Heavy duty precision machined steel ram with bronze vee gib guide system. Metal components clear anodized, electroless nickel plated, orpainted as needed. Floor model frame with locking casters. Automated, high-speed and additional safety features available to customize equipment to your production needs.